Like Altman’s revisionist interpretation, Meek’s Cutoff moves along at a leisurely pace, which itself is an anomaly in the usually brisk escalation to a duel at sundown. The languid drive of Meek’s Cutoff frequently conjures up images of tumbleweeds, which, ironically, is one of the many generic icons that the film rejects. Reichardt accentuates the unhurried momentum of the film by using takes that are long in both distance and duration, and therefore permit much of the action to play out in real time. 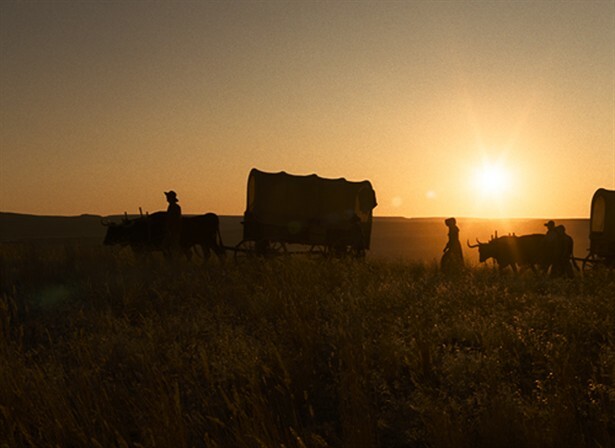 At times, this serves to amplify the dramatic tensions, while other prolonged moments draw out the monotony and misery of the pioneers’ expedition through the west. The construction of the film also permits some clever satire on the changes between then and now, particularly in one long take in which Emily (Michelle Williams, in another strong performance) attempts to ward off a predatory Indigene by loading her rifle with ammo, putty and gunpowder, and then packing it in before firing a single shot. Williams’s Emily Tetherow is the strongest rider amongst the group of travellers heading west to make good on the myths of expansion and opportunity propagating throughout America. Emily’s resilience, however, is frequently undermined by the group’s guide, Stephen Meek (played by an unrecognizably scruffy Bruce Greenwood). From the opening shots of the film, it’s clear that the group lacks direction, yet none of the migrants will speak against their misguided westerner. Most interesting, however, is the clear divide between the men and the women when it comes time to confer on important decisions. 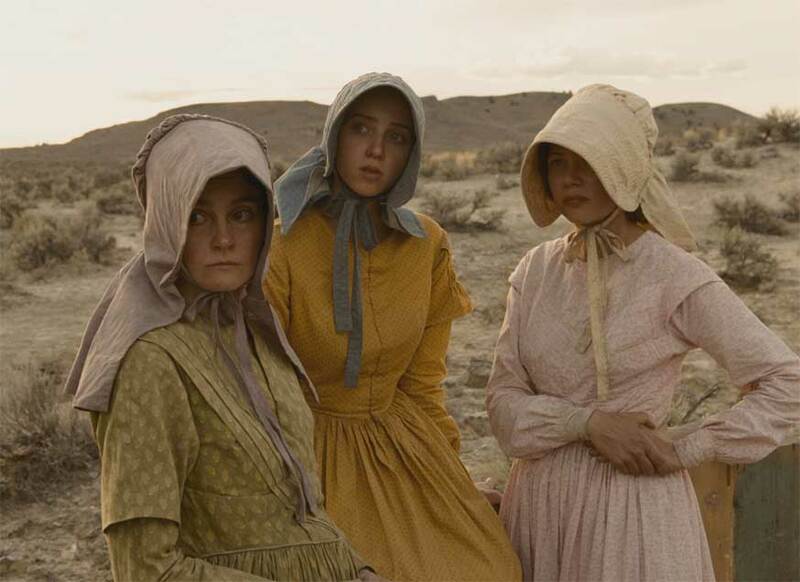 Reichardt frequently frames these conversations from the outsider position of Emily and the other two female travellers: the proud, but soft-spoken Glory (Shirley Henderson) and Millie (Zoe Kazan), the group’s hysterical baggage. In these scenes, the women simply watch from a distance and speculate on the men’s debates. It’s a skillful framing technique that conveys the gender divide in the foundations of both the genre and America itself. As the group meanders about the arid landscape, survival becomes the most pertinent quest. As anyone who spent countless hours in elementary school playing Oregon Trail during computer class well knows, the West is a difficult place to navigate. Axles break and subsequent wagon repairs create costly and time-consuming disruptions along the journey. Threats of snakebites and other wildlife attacks are also looming fears, but as the ever-present sun-scorched earth in Meek’s Cutoff reveals, the scarcity of water proves the greatest burden in the expedition. The group lands a break when Meek and Soloman (Will Patton), Emily’s husband, finally catch the Indian (played by Rod Rondeaux) whom Emily spotted earlier in their travels. Although Meek urges the group to hang “the savage” then and there, Soloman observes that their new acquaintance provides an excellent guide for a group navigating unfamiliar terrain. The men vote and opt to keep the Indian on a short lease in hopes that her leads them to water. During the group’s attempt to interact with their indigenous foe, Meek’s Cutoff carefully unravels some of the stereotypes perpetuated by Western films both early and contemporary, namely the stock characters of the bloodthirsty savage or the effeminate creature that is tied to the land. As the male characters continually shout English words at a higher volume, the film astutely notes the ignorance of classic westerners. It is only Emily who makes any progress in communicating with the Indian, despite Millie’s incessant protest that he is leading them to danger. It seems that Emily’s chore to watch from afar grants her an insight the men lack. By re-employing generic conventions anew, Reichardt and screenwriter Jonathan Raymond enliven the genre with great insight. In many ways, Meek’s Cutoff is a classic western: from the stark but artful frontier that recalls a John Ford movie, to the selected 1.33:1 aspect ratio of silver-screen classics, Meek’s Cutoff looks the part of its predecessors. In its progressive outlook, methodical pace, and, more importantly, its ambiguous, infuriating, and though-provoking ending, Meek’s Cutoff is a revolutionary film in the vein of Clint Eastwood’s Unforgiven or the aforementioned Altman classic.